Is the opl2lpt quiet, if you press the reset button on the PCB, after booting ? I'm a little surprised that the first parallel port is configured to use 3BCH; I thought that was only on even older machines. I looked at the source code to the TSR early on, but don't remember if it supports that configuration. With it being an output-only port, my theories about the problems being related to parallel port mode/type are definitely not relevant. Just like SCSI, LPT implementation seems to be quite variable, more than it should be by "standard"
I played around with virtualbox, OPL2LPT, and a pci express parallel port card, on my core i7 win 7 64 bit PC. I documented the steps in attached pdf. Has anyone attempted patching any of the LucasArts games using ADPATCH? I'm wondering, because along with the Sierra/SCI games, many of these games were squarely in the 286 era. The 386 requirement of ADLIPT misses the mark for 286's that would otherwise benefit greatly from the OPL2LPT. Hm i will test it on PS/2 Model 40SX Report back later..
matze79 wrote: Hm i will test it on PS/2 Model 40SX Report back later..
Just assembled the kit and it's working like a charm on my PS/2 Model 80 using the TSR. Got the missing IC for my OPL2LPT today, soldered it in and did a quick test with my P133: works great so far. I encounter one problem however: with the OPL2LPT connected and powered (from USB), I can no longer boot Windows 98 SE. It just completely freezes the system at the boot screen. I just built mine, tested it with my Celeron Northwood laptop with my custom-hacked DOSBox, and it works! 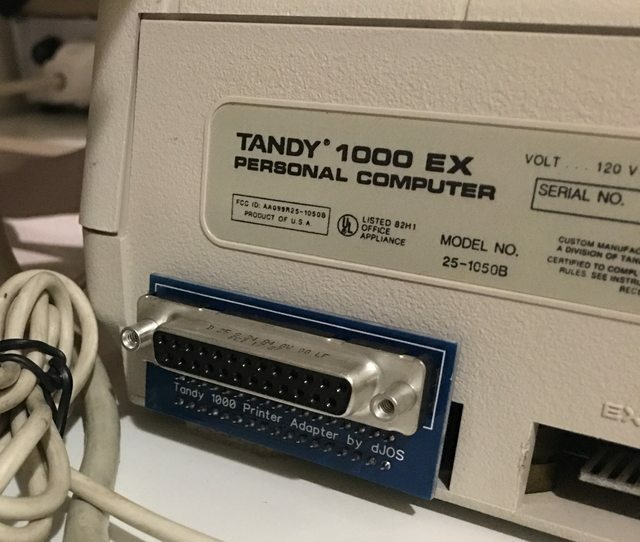 We need more ppl making patches for ADPATCH so more games can be run on 386 machines and the like without lagging 4x more than it feels without having to load the TSR and using ADPATCH instead. God of Thunder and others come to mind that could drastically benefit from having it patched like Keen and Wolf3d in order to achieve more performance. I sadly cannot code, otherwise I would spent a lot of time making more games compatible with the patch alternative, as it seems to make quite the difference on older systems this was meant for as in around the 386 16-30Mhz area. derSammler wrote: I encounter one problem however: with the OPL2LPT connected and powered (from USB), I can no longer boot Windows 98 SE. It just completely freezes the system at the boot screen. Ok, seems like this is unrelated to OPL2LPT. It now happens without it as well. Scali wrote: I just built mine, tested it with my Celeron Northwood laptop with my custom-hacked DOSBox, and it works! Hi everyone, I just made an account here to post about my OPL2LPT which recently came in the mail. I can confirm that it is working on my PCjr, which is awesome because that computer was never intended to have Adlib support or even a parallel port really. The first game I tried was Fun Seeker's Guide, but that one gave me the following error: "0x89/3 not found." So I tried Colonel's Bequest instead and the Adlib support works beautifully on that game. I'd be playing it right now except that for some reason I can't get the PCjr graphics to load. CGA works fine and even Tandy 1000 loads in a garbled state, but when I select PCjr it just stops loading for some reason. I actually had the same issue when I tried testing Fun Seeker's Guide before patching it. Does anyone know what might be causing this? snow9 wrote: Hi everyone, I just made an account here to post about my OPL2LPT which recently came in the mail. I can confirm that it is working on my PCjr, which is awesome because that computer was never intended to have Adlib support or even a parallel port really. This may more likely be a PCjr. issue than an OPL2LPT issue. I assume you have expanded your PCjr. to 640KB and loaded a memory manager to tell DOS that the PCjr. has 640KB free? You have to run the game with SIERRA.COM, not with SCIV.EXE. How garbled are the Tandy graphics? If they appear as though only every other horizontal line is being drawn, then you can do the Tandy mod to restore the missing lines on many games. I doubted that anyone would put up with the slowness of the PCjr. with Sierra's SCI titles for long. I havent read every page of this topic yet so apologies if this has been asked, does this need a bi-directional LPT port? I'd like to run one from my Tandy 1000 EX which isnt bi-directional. PS, the physical interface is not an issue, I made these adapters so I could muck around with DB25 based gear.